President Abraham Lincoln’s Gettysburg address – one of the most famous speeches in US history – is celebrating its 150th anniversary on November 19. An Abraham Lincoln impersonator will read the remarks at the Pennsylvania cemetery where the civil war leader spoke. President Abraham Lincoln gave his speech more than four months after the Battle of Gettysburg, when Union troops beat the Confederacy, in a turning point for the war. About 235,000 people commemorated the battle’s anniversary in early July. Abraham Lincoln gave his speech on November 19, 1863, as he dedicated the Soldiers’ National Cemetery in Gettysburg, where thousands of Union soldiers were laid to rest. The brief oration, delivered as the nation fought for survival, is admired for having distilled the essence of American ideas on equality, liberty and democracy into just 10 sentences. Civil War historian James McPherson and US Interior Secretary Sally Jewell are due to speak at Tuesday’s commemoration. The ceremony begins with a wreath-laying event at the cemetery. There will also be a graveside salute to US Colored Troops at noon, and a tree-planting ceremony in the afternoon. 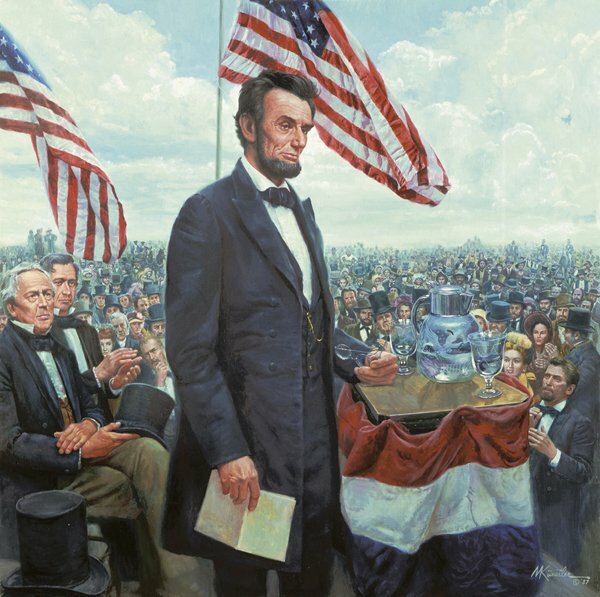 Abraham Lincoln’s speech, a mere two minutes, envisioned “a new birth of freedom” for America out of the ashes of the war between the southern slave-holding states and the northern states. “The world will little note, nor long remember what we say here, but it can never forget what they did here,” Abraham Lincoln said of those who fought the battle, in which as many as 50,000 soldiers were killed or wounded. The headline speaker that day was actually the former Massachusetts Governor Edward Everett, whose two-hour, 13,000-word monologue has since been all but forgotten. Abraham Lincoln’s subsequent comments were initially overlooked. Indeed, a local newspaper, the Harrisburg Patriot and Union, dismissed the address as “silly remarks”.